Target: Big Box Storage Franchising, Inc.
Big Box Storage, Inc. provides portable storage solutions for residents of cities and towns in the United States. The company offers storage services through company-owned facilities, and franchise outlets. It also provides moving and packing supplies, such as boxes, bubble wraps, tapes, locks, and moving pads. SMARTBOX is a leader in the portable self-storage industry, offering individuals and businesses affordable and convenient storage and local and long-distance moving solutions. The acquisition of Big Box adds key complementary markets to the SMARTBOX franchise network and will greatly enhance its long-distance moving platform. 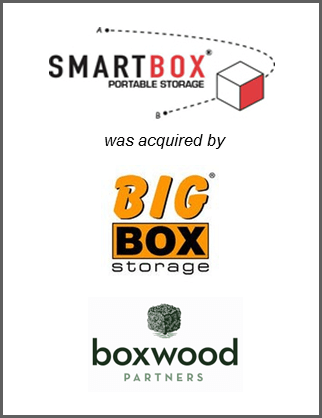 Boxwood partners advised SMARTBOX on its strategic acquisition of Big Box Storage Franchising, Inc. Boxwood Partners acted as the exclusive advisor to SMARTBOX with respect to the transaction.